A judge has ordered the suspect in a deadly shooting at a Maryland newspaper to remain detained. Judge Thomas Pryal said Friday that he found a likelihood that 38-year-old Jarrod W. Ramos is a danger. Ramos appeared in an Annapolis courtroom via video feed. He appeared to watch attentively during the hearing but never spoke. He was dressed in blue detention clothing. He is charged with five counts of first-degree murder in the killings inside Maryland’s Capital Gazette office on Thursday. Authorities say the Maryland newspaper targeted in a shooting attack that left five people dead didn’t want to press charges in an earlier case. Police Chief Timothy Altomare said at a news conference Friday that the Capital Gazette didn’t press charges over social media threats the shooting suspect had made against the newspaper in 2013. Authorities have charged Jarrod W. Ramos with five counts of first-degree murder in the killings inside Maryland’s Capital Gazette office on Thursday. 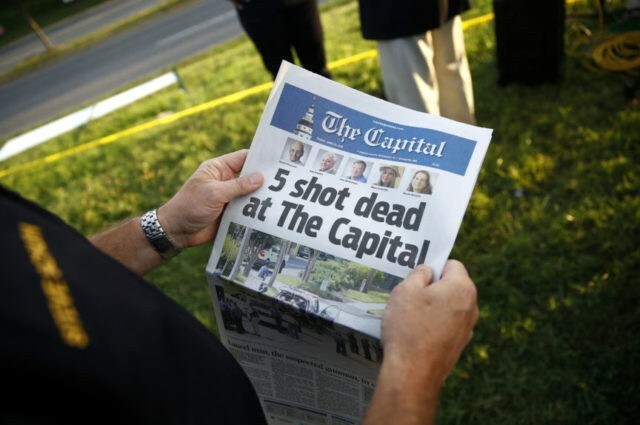 Authorities say the suspect in the deadly shooting at a Maryland newspaper used a pump-action shotgun in the attack at the Capital Gazette newspaper that left five people dead. Police Chief Timothy Altomare also said at a news conference Friday that it is “absolutely untrue” that suspect Jarrod W. Ramos mutilated his fingertips. Altomare also said that employees Rachel Pacella and Janet Cooley had been treated at a hospital and released after being injured during Thursday’s attack. The city of Annapolis is planning a vigil for the victims of a mass shooting at the Capital Gazette newspaper. The city announced on social media Friday that the vigil would begin at 8 p.m. at a public square near the Capitol, followed by a march to a dock for a service by the water. The Episcopal Diocese of Maryland announced that the city’s houses of worship had planned a prayer vigil at 7 p.m. Friday at a mall across the street from the shooting site. All are welcome. On Saturday, the 5:30 p.m. Eucharist at St. Anne’s Episcopal Church in downtown will be offered for the victims. A Maryland newspaper attacked by a gunman has kept its promise to put out the next day’s paper, despite the shooting deaths of five people in its newsroom. Friday morning’s edition featured in-depth coverage of the shooting and obituaries of the five people killed. Each victim’s photo appeared below the masthead. Court documents say a gunman who fatally shot five people at a Maryland newspaper tried to hide under a desk after the attack until police arrived. A statement of probable cause obtained Friday by The Associated Press says surveillance video captured Thursday’s events at the Capital Gazette. It says Jarrod Ramos entered the newspaper’s office around 2:30 p.m. The statement says Ramos used a “long gun firearm” and shot out the business doors, then shot people he encountered inside, killing five. The statement says Ramos then “attempted to conceal himself under a desk” until police arrived and located him. Ramos was in custody Friday and scheduled for a bond hearing at 10:30 a.m.
A spokeswoman for the Office of the Public Defender said the Anne Arundel office would be representing Ramos. She declined comment. Police say a man firing a shotgun killed four journalists and a staffer at Maryland’s capital newspaper before officers quickly arrived and took him into custody. Police say they are a questioning the suspect, a white man in his late 30s, following Thursday’s attack on The Capital Gazette in Annapolis. Journalists described how they scrambled under desks and sought to hide during a few minutes of terror. They recounted hearing the gunman’s footsteps as he moved about the newsroom, firing his weapon. The attack came amid months of verbal and online attacks on the “fake news media” from politicians and others from President Donald Trump on down.